If you though the highest salaries in San Jose were dominated by tech, the list below provided by Zippia says otherwise. 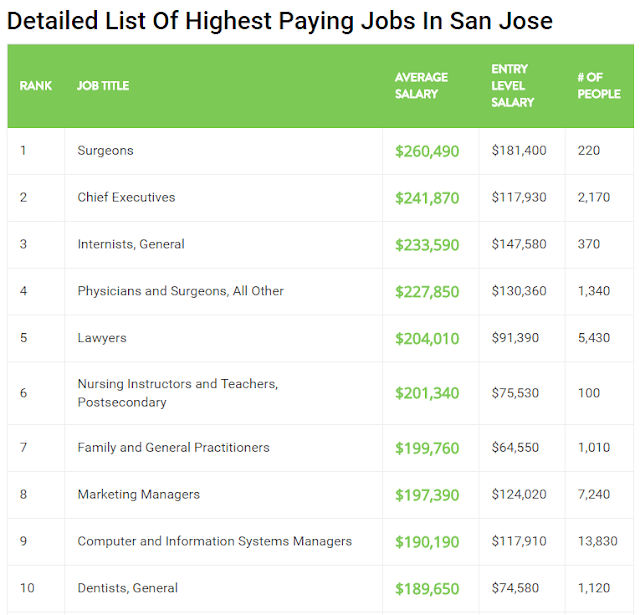 Healthcare dominates the Top 10 with six of the ten highest paid jobs in San Jose. Local surgeons pull in an average of over a quarter-million dollars a year. C-level executives, internists, physicians, lawyers, and nursing instructors also break the $200k salary threshold. One thing this list does not account for is stock options which can easily tilt the balance of total compensation towards tech. For the full "Top 100" list, head over to the source link below.